I started work on a set of simple, cardboard building models using pepakura originally for Serious and Organised but which, like Serious and Organised, I’ve yet to finish. A discussion on the SFSFW mailing list kicked me into finishing a simple one of a house. It can either be used as a single, semi-detached house or by putting several together a terrace. I’ve got additional bits that can be used to customise this model in the works including chimney stacks and extensions for the ends and rear but I’ve not textured them yet. I’ve made versions for 28mm, 25mm and 15mm gaming and I suggest printing them on thin (160gms) white card for use. Assemble the walls together first, then add the roof and finally add the base. You can leave off the base if you want as they are reasonably rigid without it. Any comments or suggestions either drop me an e-mail or leave a comment on my blog. 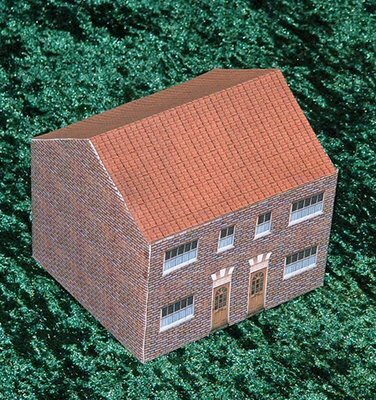 Update: The 15mm and 25mm models are now out of Beta and available free from the impworks web site cardboard buildings page.